만지송은 양양 석보면 답곡리의 마을 뒷산에서 자라는 소나무로 나무의 가지가 아주 많아 ‘만지송’이라는 이름이 붙었으며, 옛날 어떤 장수가 전쟁에 나가기 전에 이 나무를 심으면서 자기의 생사를 점쳤다고 하여 ‘장수나무’라고도 불린다. 만지송의 나이는 약 400년으로 추정되며, 높이가 12.1m, 둘레는 3.94m이다. 3개의 줄기가 합쳐져 한 줄기가 된 것 같으나 실제로는 땅에서 50㎝까지만 한 줄기이며, 그 위부터는 줄기가 4개로 갈라져 올라가면서 매우 많은 가지가 여러 방향으로 뻗어 있다. 이렇게 뻗은 가지는 거의 땅바닥에 닿아 나무의 모양이 무덤모양과 비슷하다. 만지송의 바로 옆에는 한 그루의 나무가 있는데, 그 나무의 가지와 만지송의 가지가 어우러져 언뜻 보기에 한 그루인 것 같이 보인다. 답곡리 마을 사람들은 만지송을 마을을 지켜주는 나무라고 여겨 왔으며, 아들을 낳지 못하는 여인이 만지송에 정성스럽게 소원을 빌어 아들을 낳았다는 전설도 있다. 만지송은 오래된 나무임에도 가지가 많아 모습이 매우 아름답고 잘 보존되어 생물학적 자료로서의 가치가 높고, 마을을 지켜준다고 믿어져온 나무로서 민속적 가치 또한 크므로 천연기념물로 지정하여 보호하고 있다. 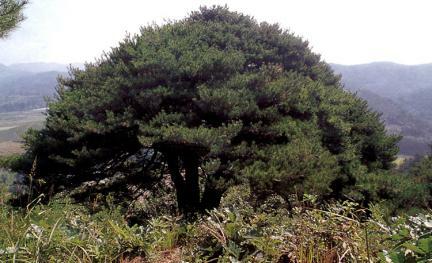 Manjisong is the name of a pine tree. 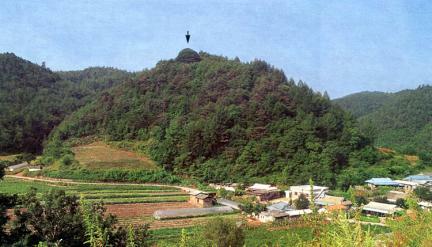 The name Manjisong stems from the fact that it has many branches. (Manji literally refers to “ten thousand branches” in Korean.) 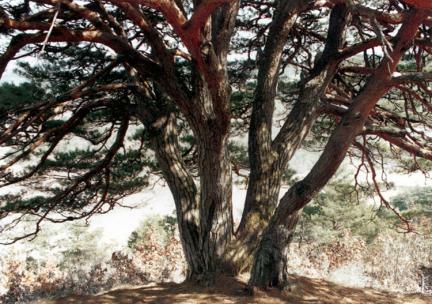 The Manjisong Pine Tree is about 400 years old, with height of 12.1m and girth of 3.94m. Three of its boughs seemed to have been made into one; actually, only 50cm from the ground level is one. With the branches growing like this, practically hanging down to the ground, this tree looks like a dome on the whole. 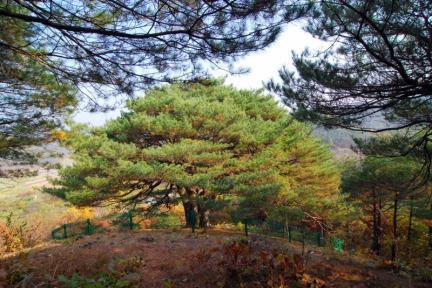 Right beside this tree is another tree whose branches were joined together with the branches of Manjisong. Therefore, they look like the same tree. 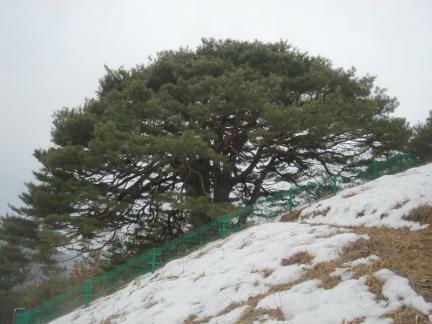 Villagers regard this tree as the guardian deity of the town. 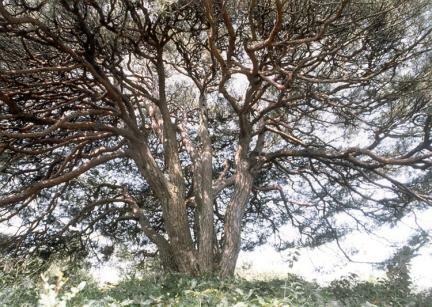 Although an old tree, Manjisong still has many branches and a beautiful shape. This tree has been protected well. 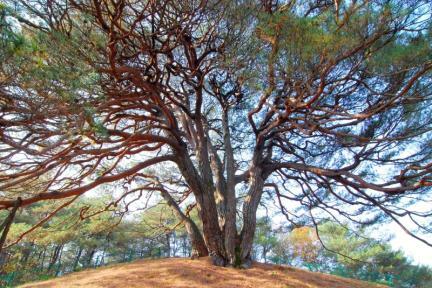 It has been designated and preserved as a Natural Monument for its great biological value as historical data.